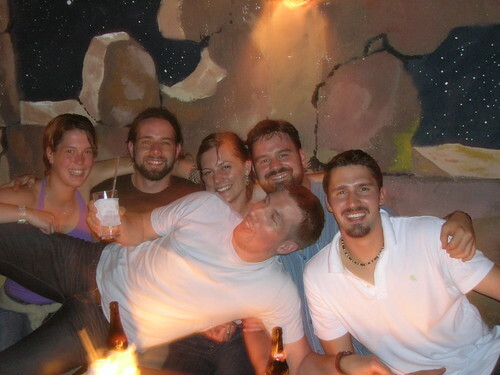 The day before we left my apprehensions were running out of control. Every moment closer to the flight the worse of an idea this whole caper seemed to be. I recognize the tumultuous emotions they have happened every time I've gone abroad but it doesn't make them any easier to manage. But then, as before, the moment we hugged Mom goodbye and stepped foot into the airport an eerie calm descended on both of us. Suddenly, once in the thick of it, there wasn't anything to be nervous about. I've experienced something similar to this before but until now I've never experienced it with anyone else. So it was great fun to look over at Tyler, smirk, and laugh at the delicious feeling of anticipation. 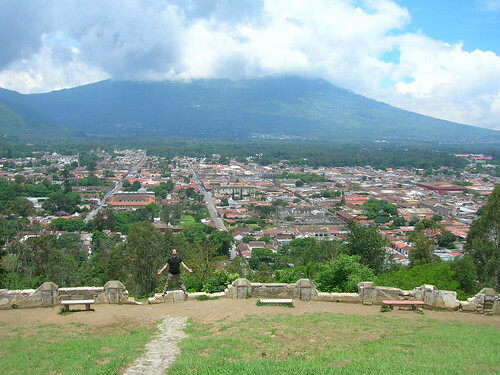 We landed in Guatemala City, but high tailed it out of there to the former colonial capital city of Antigua. It's well up into the mountains (Volcanos), peaceful (aside from the occasional chattering sound of what could be gunfire), and brilliantly colored city. The food has been wonderful, the other travelers fascinating and the locals kind. Here is Tyler, on a mountain overlooking the city, trying to blend in by pretending to be a another volcano. We've already climbed up an active volcano, got hopelessly lost in a huge market, and had a merry night with other travelers. One bearded traveler we met, Mark (right side in the picture below), is at the very first stop of a year long trek off the beaten path. I'll be following his fascinating travels at his website GibsonTravels.com. * As always, click any of these picture or the pictures to your right to see a lot more!